Never really the romantic type I set out this year to surprise my wife. Back in the day, high school days, I would head over to see her and stop at 7-11 and pick her up a large Icee and a Zero candy bar. After heading off to college, I would come home on the weekends to see her. I would take the Agnew/Villa exit on I-40 and head north. At the intersection of 10th and Villa I would stop at a small independent flower shop. I would select one carnation and take it to her. These were some of my best romantic moves. School and busyness often took their toll and any thoughtfulness on my part generally came off as “last minute.” It wasn’t the intent. It just was me. We celebrated our 25th wedding anniversary this past March. I wrote earlier of my latent romantic streak coming to life. Beginning in January and so far every 18th I have given a gift and dubbed 2008 “Anniversary Year.” Yes, that is the sound of me grunting while patting myself on the back. I will say, I did win some brownie points and surprised not just my wife, but also our two daughters. They have been complicit with me plotting the next gift. They like this sort of thing. May comes and with it a surprise for me. Little did I know, that according to her, Patty had been planning “Birthday Month.” For the past eight days I have found gifts of all kinds either in my office or at home. Some of the gifts – a framed piece of artwork from one of our trips to Colorado, a six-person “Wa Hoo” game board, a novel with a missing Van Gogh as the storyline, a beanie baby baboon (Do not ask me to explain that one! 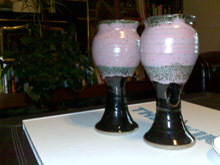 ), a decorative piece of glassware for my office desk, a pair of hand-made chalices, and a pair of rubber boots! Yes, with age comes the fact I am missing one gift. Oh the memory where is it going? Each of these gifts mean something in their own right. But, despite her telling me not to expect something everyday, it has been just that, every day. Sometimes people think they know my wife. Most of the time they only know a bit of who she is. There have been times in our married life she would do something thoughtful for another person without their knowledge and often mine. She gives in to the “gut” feeling someone could use some flowers, a call, a hug, any number of things she is ready to give. For some she does not fit the traditional mold of a “pastor’s wife.” That would be because she is not first a pastor’s wife. She is first my best friend. From there she wears too many hats for me to name. One common thread that runs through them all – thoughtful. Stay tuned, I just may let you know what the other 23 gifts are.